Uglyworld #914 - Thanks Everyone!!! (365-365), originally uploaded by www.bazpics.com. Wage got some of the gang together this evening for a big celebration party as this is the final day of their photo a day, 365 project. 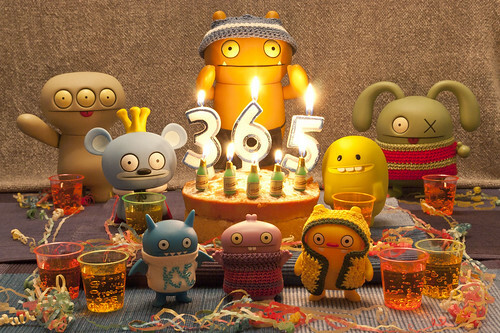 Even though the guys are still disappointed that Babo wasn't able to make it back in time for the big finale party, they wanted to give all of you a massive thanks to each and every one of you for all yours views, comments and favourites every single day over the last year!!! And don't worry, this isn't the last you've seen of these guys and stay tuned for some more madness coming soon!